People want to hear a voice, see a face, connect on some level if they’re going to relate to your company. There is no doubt about it. Audio and video presentations go a long way to build long and profitable business relationships with customers. Brochures, flat, static web sites and ordinary business cards don’t enhance customer relationships the way an online multimedia presentation using audio and video does. NetXpression provides the next best thing to a face-to-face meeting. Here’s a thought. Why not take your best sales people and put them on the Web right now for all the world to see? 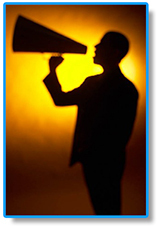 Think about it – your best sales people are good communicators, right? Extend their reach. Place them in an audio or video presentation, conveying their persuasion, passion, and conviction about your product or service! This will positively go a long way to boost sales. Let’s take this another step. How about video clips of satisfied customers telling how much they liked your product. Now, that would be something special. It’s a lot more effective than a static quote found in a brochure or on a web site. The number of ways NetXpression can boost sales is practically unlimited. Click Here to learn more about using NetXpression to increase sales. Showcase your company and its employees as never before. Hey, you’ve got a great story to tell, so why limit yourself? Add audio and video to your communication strategy and show how persuasive, credible and exciting your company is to do business with. Many different types of companies can enjoy the benefits that only a dynamic and entertaining NetXpression presentation can offer. Launch an NXcampaign for great results. Some of our popular users include the following industries:Software Companies, Legal and Investment Professionals, Human Resources Departments, Marketing and Business Consultants, as well as Real Estate Agents. Launch a new product like never before. A simple email or letter simply doesn’t cut it anymore. More and more companies are discovering the power and results from online presentations, especially when they want to emphasize something new. Use NetXpression to launch products in a memorable and effective way. The CEO may not be able to personally meet with every employee to thank them for a job well done and give an update on progress. A NetXpression online presentation allows the CEO to do a brief weekly update with employees giving an update on forward momentum and highlighting success stories. When a CEO personally acknowledges individual achievements in a public forum it can go a long way in building a collaborative work environment, teamwork, and boost productivity. More importantly, employees can view the presentation on their own time, rather than halting work for a company-wide meeting. Distinguish your company in the minds of potential and existing customers. In today’s world of intense competition and hundreds of images vying for attention, NetXpression allows you to stand out from the crowd. Effective branding should be memorable and an online presentation is the perfect way to help position your company in the minds of customers. Do a weekly presentation! It really works. More companies are using electronic newsletters to communicate with customers on a regular basis. They are great at building good will. But the strategy is now very common and losing its effectiveness. That’s why the online presentation takes your company into another dimension of effectiveness. It’s the next generation of ongoing communication with existing and new customers. Use NetXpression to build customer relationships and to stay ahead of the curve. Standardized training is the key to making sure customers have consistent experiences with your company. In the past, comprehensive training has been expensive. Not now. Make an unlimited number of presentations with NetXpression and discover new and innovative ways to train employees. Click Here to learn more about training with NetXpression. What can NetXpression Do For You? NX can personalize your web site and make it come alive! You’ve seen it before. Visit most web sites and you’ll see flashy animations, copy, and a bunch of links. There isn’t much personality out there. Well, NetXpression changes all of that! Now users little experience can equally create powerful online multimedia presentations in minutes. A simple photo album is one thing. A photo album with a personalized voiceover describing each image is 1,000% more effective. Use NetXpression to build a simple electronic scrap book, or use it to show clients items for sale, screen shots of technology products, employee resumes, and so much more. An online photo album has almost unlimited uses, and with NetXpression they’re so easy to create!! Get NX Now and you’ll see measurable results in everything you do.